Criminalizing mental illness is costly, inhumane and counterproductive. On average it costs $143 a day to incarcerate someone who is not mentally ill, but twice as much if the individual has a psychiatric condition and requires doctor’s care, medication and extra security. Experts say the money used to lock people up could be better spent helping people get the mental health and other social services they need to live productive, meaningful lives. via Guilty of Mental Illness. As we try to balance constitutional rights and public safety regarding people with mental illness, the traditional legal approach has been to prohibit firearms from involuntarily-committed psychiatric patients. But now we have more evidence that current laws don’t necessarily keep firearms out of the hands of a lot of potentially dangerous individuals, according to a recent Duke University report on linking the issues of anger and access to guns. Researchers found that anger-prone people with guns were at elevated risk for a range of fairly common psychiatric conditions such as personality disorders, alcohol abuse, anxiety, and post-traumatic stress, while only a tiny fraction suffered from acute symptoms of major disorders such as schizophrenia and bipolar disorder. Fewer than one in 10 angry people with access to guns had ever been admitted to a hospital for a psychiatric or substance abuse problem, the study found. As a result, most of these individuals’ medical histories wouldn’t stop them from being able to legally purchase guns under existing mental-health-related restrictions. Researchers suggest data could support “dangerous persons” gun removal laws, like those in Connecticut and Indiana, or a “gun violence restraining order” law like California recently enacted. Such laws give family members and law enforcement a legal tool to immediately seize guns and prevent gun or ammunition purchases by people who show warning signs of impending violence. via Nearly one in ten U.S. adults have impulsive anger issues and access to guns — ScienceDaily. When a police officer in Memphis killed a mentally ill man who was wielding a knife, the public outcry was strong and swift. Now, 28 years later, that tragedy has given rise to a movement to teach police how to better deal with people with mental illness they encounter in the community. That movement is Crisis Intervention Training, the so-called “Memphis model” of policing that was developed in the wake of the 1987 tragedy. CIT is a curriculum to teach law enforcement officers how to recognize when someone is having a psychiatric episode, how to de-escalate these potentially explosive situations and how to keep people from jail when they need mental health treatment. This week, hundreds of law enforcement officers along with mental health advocates and providers convened at the McKimmon Center on the NC State University campus in Raleigh for a biannual conference on helping all those people work together better to serve North Carolinians with mental health problems. He said this kind of interaction can save lives. The evidence backs Page up: Research has shown that “police-based diversions” and CIT reduced the number of arrests for people with serious mental illnesses. In one study, the number of re-arrests for people with psychiatric problems dropped by 58 percent after officers were trained. The CIT training benefits officers too; other studies have shown that fewer law enforcement personnel were injured after training. The 40-hour training program includes basic information about mental illnesses and how to recognize them, information about and visits to providers in the local mental health system, a review of laws and contact with people with mental health problems and their family members. The goal is to help officers learn to recognize potentially explosive situations and defuse them, getting people to treatment rather than jail, or worse. “Basic CIT … is basically set up as a diversion model to keep low-risk offenders from going into the jail system on low-level crimes as opposed to getting them into the mental health system for services,” said Lori Ray, CIT coordinator for the Durham PD. via Law Enforcement Officers Find Better Ways to Work With Mentally Ill | North Carolina Health News. and Training Improves Police Response to Mental Health Crisis | North Carolina Health News. What we do know is that the mentally ill are dramatically more likely to be the victims of excessive police force, and to be the victims of death by cop. A study by the Portland Press Herald in Maine found that nearly half of people shot by police between 2000 and 2012 were mentally ill, and that police lack proper training on defusing deadly conflicts. A KQED review in San Francisco this year found a similar proportion of mentally ill victims. In several other cities including Portland, Oregon, and Albequerque, New Mexico, Department of Justice investigations have concluded that officers have systematically used more force than necessary against the mentally ill, leading to deaths or serious injuries in many instances. It’s a common scenario for police interactions with the mentally ill to escalate from what starts as a call for help. In fact, while Cleveland police didn’t turn to their guns, police do in many other instances. Last month, a psychiatric patient was shot and killed last month while being transported to a mental institution. One of the police shootings that prompted a scathing DOJ investigation of the Albuquerque, New Mexico, police was a shooting of a suicidal Iraq War veteran who was pointing a gun at his own head. And last year, several prominent police shootings involved incidents in which family members of the victims had called the police for help. Protocol that are typical for potentially violent incidents — such as barking police commands — can actually have an adverse impact on those with mental illness. Particularly in instances when police know before they arrive on the scene that a patient is suffering from mental illness — in fact is in need of police help precisely because of their mental illness — some police departments deploy special mental health crisis teams. Among the recommendations of a 2012 report to police chiefs on the use of force against those with mental illness or addiction problems are “slowing down the situation” by getting a supervisor to the scene, and identifying “chronic consumers” of police services. But these tactics are under-employed in many police interventions. via How Did This Unarmed Schizophrenic Woman End Up Dead At The Hands Of Police? | ThinkProgress. Most police officers have frequent contact with people with mental illness, but have minimal training in recognizing the symptoms and assessing when they should be taken to a clinic or emergency room for further evaluation. Perhaps the most useful intervention … is to provide police officers with some good, basic mental health knowledge. When guns are present, officers might use de-escalation skills to temporarily remove weapons from individuals at-risk of violence or suicide. If one happens to be in a state such as Indiana that has a preemptive “dangerous person” gun seizure law, police can remove firearms without a warrant, pending a judicial hearing, even if the person with mental illness is not imminently dangerous at the time and wouldn’t meet criteria for involuntary commitment. We also might examine the minimum age at which people can easily purchase guns. FBI data indicate that 45 percent of identified murderers are younger than age 25. Many young adults are experiencing (often for the first time) serious mental health or social difficulties, and thus pose special risks to themselves and others. Rental car companies apply extra scrutiny to drivers under the age of 25. Perhaps there’s a lesson there for gun policy. via Why law enforcement missed Elliot Rodger’s warnings signs – The Washington Post. Six months after Congress gave up on providing long-term unemployment benefits to job seekers who have exhausted their state-level unemployment insurance systems, new research shows that less generous unemployment support systems are connected to higher suicide rates. States that offer higher levels of replacement income for residents who are looking for work but unable to find a job experience significantly lower suicide rates than less generous states, according to a study by two London School of Economics researchers and a University of California San Francisco epidemiologist. 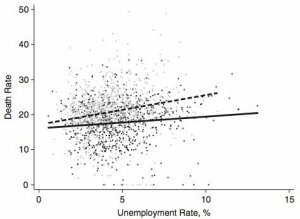 Suicide rates have long been known to correlate with economic conditions and the unemployment rate, but the new research finds that higher unemployment insurance payments dull the connection between economic factors and suicide. The mental health benefits of providing a buffer to out-of-work people provide further evidence that such programs are a net benefit for society rather than a net cost. Unemployment insurance has long been understood to provide more economic benefits than what it costs to administer and pay out, and it ranks among the most efficient forms of economic stimulus that the government has at its disposal. via More Generous Unemployment Benefits Lead To Lower Suicide Rates. Severe mental illnesses, like schizophrenia and bipolar disorder, are brain diseases—biological conditions like heart disease or epilepsy. Yet in this country, the institutions most likely to be treating people with these illnesses are not hospitals, but rather jails and prisons. According to a new report from the Treatment Advocacy Center TAC, a nonprofit advocacy organization, the United States has fully returned to the 18th-century model of incarcerating the mentally ill in correctional institutions rather than treating them in health care facilities like any other sick people. In 2012, there were roughly 356,268 inmates with severe mental illnesses in prisons and jails, while only 35,000 people with the same diseases were in state psychiatric hospitals. In 1955, there was one psychiatric bed for every 300 Americans. In 2010, there was one psychiatric bed for every 7,100 Americans—the same ratio as in 1850. The numbers of incarcerated mentally ill have been growing, and TAC reports that their treatment in the corrections system is nothing less than abominable. Mentally ill inmates are more likely to become the victims of sexual assault and abuse. They’re also overrepresented in solitary confinement, and they are much more likely than other prisoners to commit suicide. Putting the mentally ill in jails instead of hospitals isn’t saving the government any money. In Washington state, for instance, in 2009, the most seriously mentally ill inmates cost more than $100,000 a year to confine, compared with $30,000 for others. One reason for the disparity: According to the report, mentally ill people tend to stay in jail longer than other prisoners because they aren’t likely to get bail and also because they are often chronic rule-breakers. For example, according to the report, in Florida’s Orange County jail most inmates stay an average of 26 days, but mentally ill inmates are there for 51 days on average. Even worse is New York’s Rikers Island jail, where last month a homeless, mentally ill veteran, who’d been arrested for sleeping on the roof of a public housing project, “basically baked to death” in his cell. The average stay for an inmate at Rikers is 42 days. Mentally ill inmates get stuck there for an average of 215 days. 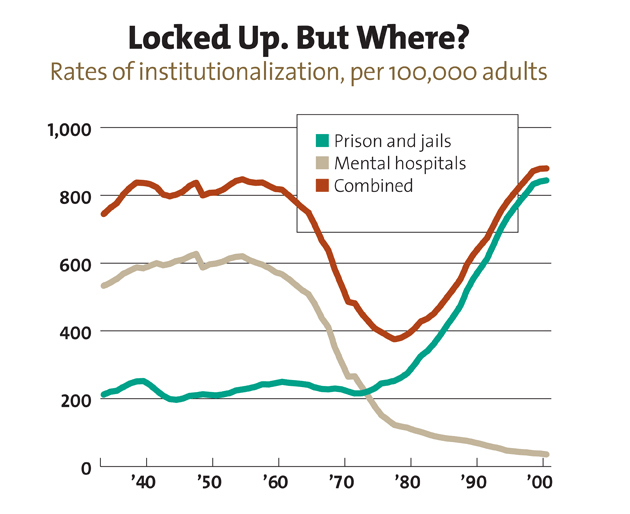 via There Are 10 Times More Mentally Ill People Behind Bars Than in State Hospitals | Mother Jones.